A fantastic weekend of sightseeing in Budapest, no hop on hop off bus for us instead we picked up a copy of city walks and off we set …..
First on our list was Gellert Hill visiting the Central Market Hall on the way, which is the largest and most attractive market in the city. The walk through the park up Gellert hill was lovely giving us great views of the city. The sights included Statue of St Gellert,The Citadel and Liberty Statue . Time for coffee then so we went in search of the world famous historic Gerbeaud Coffee house, a grand building with glittering chandeliers and marble topped tables. 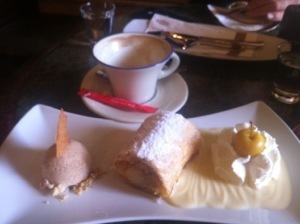 Although it was expensive it was a real treat with such posh cakes presented so beautifully, I had a divine Apple strudel served with cinnamon ice cream vanilla sauce and whipped cream, while Geoff sampled an amazing looking caramel ice cream sundae. Next it was Castle Hill, you could take the Buda Castle Funicular up but of course we choose to walk ..
More beautiful views and cobbled streets with such grand buildings, St Stephens Basilica, Fisherman’s Bastion, Matthias Church and The Royal Palace. On the way down we saw Matthias fountain too. On our walk we had also been checking out the Turkish baths in the end we decided to try a smaller local one rather than the bigger touristy ones . We spent a good three hours at Kiraly baths, where they had 3 medicinal baths a plunge pool and a sauna. Water temperature ranged from 40c to 26c though I thought the plunge pool was much colder than 26c ! Much to our amazement even in this local baths swim wear is now compulsory …. The most touching part of our sightseeing had to be the “shoes on the Danube ” sculpture , it honours the Jews who were killed in World War 2 , they were ordered to take off their shoes ,then shot so they fell into the river and were carried away. This entry was posted in Hungary on October 10, 2013 by Sally.